Duraquip , a family business that provides transport, mining, agricultural and civil industry solutions have two models of bulk tippers on offer in their product range, steel and aluminium. The Duraquip steel grain tippers are road train ready and can hold a large capacity whilst also maintaining a good tare weight. Along with a range of axle and suspension options the tippers have a 2-way air operated tail gate. 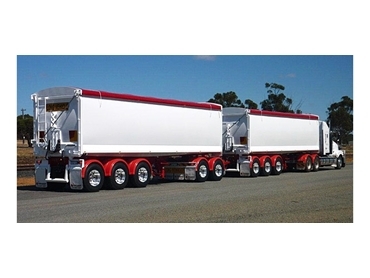 Available in three different sizes, 9.1m, 9.6m and 10.1m the steel grain tippers have a quality finish and are made in Australia. The Duraquip aluminium grain tippers get a tare weight advantage and have the option of a chassis tipper or a tip over axle too. There are multiple options available for different capacities and lengths.